I’m thinking about getting this one for Jason, since he does most of the cooking in our family. We use recipes from Spark all the time, and he always prefers them when they come from Chef Meg because they’re more reliable. I really Sparkpeople’s website. You can track the food you eat, your exercise, and be part of an online community. With the number of recipes that members post on the site, it’s no wonder they developed a cookbook! Will have to check this out. Thanks! that misplaced chicken dish sounds delicious. I’ve used Sparkpeople in the past and frequently printed out their recipes. I had no idea they had a cookbook! I’ll have to check it out. Thanks! I’m a hit-or-miss Spark gal but I do enjoy their recipes. I didn’t realize that they had a cookbook out too. I definitely need to check this out as a way to update my menus! Sounds like this has alot of good advice in addition to the recipes. 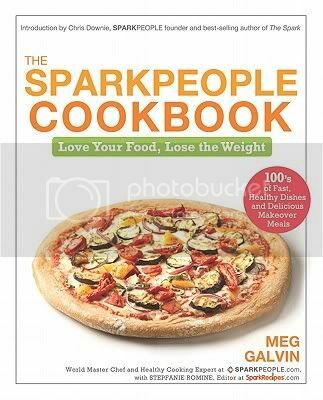 I use MyPlate and My Fitness Pal, but have heard good things about sparkpeople too. I’ve used Spark People a few times. Their recipe analysis is usually pretty accurate. Do the recipes in the book include nutritional data? I have this book and have just glanced at it. It does seem more like a lifestyle book than just a cookbook. I have a friend who swears by Sparks People. Cool they have a cookbook out. I honestly don’t believe that dieting will get you anywhere (other than miserable). Losing weight happens the old-fashioned way. To quote Michael Pollan: Eat food. Mostly plants. Not too much. Combine all that with some form of exercise – mine is walking an hour a day, but planning to add in Aikido at some point this year – and you have weight loss plus healthier eating habits. Glad to see their cookbook is aimed this way, too. I love the idea of having section on herbs and seasonings. This book sounds very informative and a useful resource! other than the one misplacement, this sounds like a well put together book.